FRANKFORT, Kentucky, October 8, 2012 (ENS) – Environmentalists’ discovery of thousands of false pollution reports at dozens of coal mines in eastern Kentucky has prompted a Kentucky court to allow, for the first time, citizens and groups to intervene in a Clean Water Act enforcement case brought by the state. A coalition of public interest groups and citizens Friday filed the historic settlement with International Coal Group, Inc. and the state Energy and Environment Cabinet in Franklin County Circuit Court. If approved by Judge Phillip Shepherd, the settlement will cover thousands of water pollution violations and years of false reporting by the company and insufficient enforcement by the state. 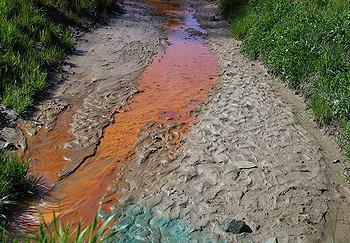 The crux of the settlement is a requirement for ongoing third-party auditing of International Coal Group’s water pollution monitoring and reporting to ensure the company submits accurate data to the state in the future. With the assurance that the money will go directly to fund general water quality improvements and water monitoring programs in eastern Kentucky, the citizens and environmental groups agreed to accept civil penalties originally assessed by the Energy and Environment Cabinet against ICG for years of false reporting of pollution discharges, although the penalties are only a fraction of the maximum allowed by the Clean Water Act. The settlement also sets fines for any future violations. The coalition is asking the court to set a date for a hearing on the merits of the agreement. In 2010, the nonprofit groups Appalachian Voices and Waterkeeper Alliance reviewed the Cabinet’s own records and discovered false pollution reports amounting to more than 20,000 violations of the Clean Water Act at dozens of coal mines in eastern Kentucky. The mines are owned by Kentucky’s two largest producers of mountaintop removal coal, International Coal Group and Frasure Creek Mining, a subsidiary of India-based Essar Group. ICG, acquired by Arch Coal in 2011, produces coal from 12 mining complexes in Northern and Central Appalachia, including Kentucky. The nonprofit investigators discovered that for years, the companies had apparently cut and pasted the numbers from one pollution discharge report to the next, changing the dates but reporting the exact same monitoring data in consecutive quarters. In October 2010, the coalition, which includes Appalachian Voices, Kentuckians For The Commonwealth, Kentucky Riverkeeper, Waterkeeper Alliance, and several individual citizens, filed notices of their intent to sue ICG and Frasure Creek. The revelation of the false reporting triggered an investigation by state regulators, and the two companies began reporting higher levels of pollution in their wastewater discharges, sometimes spiking to 20 times the previously reported level with thousands of violations per reporting period. Before the problems were brought to light, the companies had rarely, if ever, reported violations of the discharge limits in their permits. In response to the coalition’s notice, the Cabinet attempted to reach a settlement with each of the coal companies, which denied liability. The citizens and environmental groups objected that the settlements contained no measures to ensure the companies would submit accurate reports in the future, and only assessed a nominal fine of a total of $660,000 for both companies. Judge Shepherd withheld approval of the settlements and allowed the coalition to intervene in the case. The citizens groups have been in negotiations with ICG and the state since January. “ICG does not admit any liability to the Cabinet or to Appalachian Voices arising out of the transactions or occurrences set forth herein, but agrees to the entry of this Consent Judgment to … avoid further litigation of these claims between the Parties,” the agreement states. At the same time, ICG waived its right to contest liability for the violations. The settlement, if approved by the court, would only affect ICG; no agreement has been reached with Frasure Creek. The court will decide whether or not to enter the originally proposed settlement between the cabinet and Frasure Creek. The Cabinet investigated laboratories conducting wastewater monitoring and testing services for the coal mining industry and determined that their quality control and quality assurance procedures are often inadequate, in part due to a lack of clear regulatory standards and certification programs. In 2011, the Cabinet proposed and the Kentucky General Assembly adopted legislation giving the Cabinet authority to establish standards and a certification program for these laboratories. In the settlement agreement, the Cabinet says it “expects to propose regulations in 2012” to implement the certification program to address laboratory quality assurance and quality control issues.